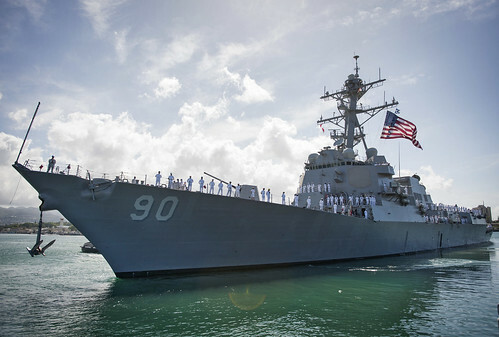 PEARL HARBOR, Hawaii - The guided-missile destroyer USS Chafee (DDG 90) departed Joint Base Pearl Harbor-Hickam on an independent deployment to the U.S. 7th and 4th Fleet areas of operation May 18. Chafee's crew of more than 300 Sailors will conduct theater security cooperation and maritime presence operations with partner nations as well as participate in exercise Talisman Saber within U.S. 7th Fleet area of operations and is expected to play an integral part in counter-illicit trafficking mission Operation Martillo (Spanish for "hammer") in the U.S. 4th Fleet area of operations. Along with the crew of Chafee, the drug interdiction team includes the ship's organic visit, board, search and seizure team providing support for the embarked Coast Guard Law Enforcement Detachment. Helicopter Maritime Strike Squadron (HSM) 37 Detachment 6 will provide embarked air support. Chafee will also participate in the Oceania Maritime Security Initiative (OMSI), a joint Department of Defense, Department of Homeland Security and Department of Commerce program. The ship will support maritime law enforcement operations to administer U.S. and Pacific Island Nations fisheries laws and the suppression of illicit activities. "This ship and crew are ready for any real world operations," said Cmdr. Shea Thompson, Chafee's commanding officer. "There is no other team I would rather deploy with." Chafee's mission is to conduct sustained combat operations at sea, provide primary protection for the Navy's aircraft carriers and battle groups, as well as conduct independent operations as necessary. Chafee is assigned to Destroyer Squadron 31 and is homeported in Hawaii as part of U.S. 3rd Fleet. U.S. 3rd Fleet leads naval forces in the Eastern Pacific from the West Coast of North America to the international date line and provides the realistic, relevant training necessary for an effective global Navy.